BBC celebrates 75 years of television | What Hi-Fi? It's exactly 75 years to the day since the launch of the first continuous TV service in the world, broadcast by the BBC from Alexandra Palace in north London. At the time, two different systems were being tested on alternate weeks for six months: John Logie Baird's 240-line mechanical system, and the EMI-Marconi 405 electronic system. The latter eventually won. 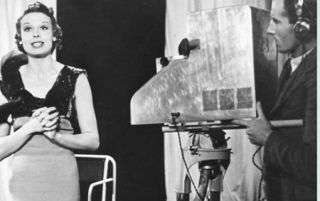 One of the first broadcasts featured the musical theatre and film actress, Adele Dixon (above), who performed the very first rendition of the specially commissioned Magic Rays of Light. Critics were not impressed, The Times opining: "Man is basically a social animal, and will not forsake the gregarious pleasures of theatre and restaurants for the lonely pleasures of TV at home." Oh dear. To mark the occasion BBC History has teamed up with Alexandra Palace and cultural organisations around the UK, including schools and colleges, to create "a diverse range of activities both on and off air". During this coming weekend, November 5th-6th, Alexandra Palace will open the doors of the famous TV studio where it all began to the public, as well as offering visitors a chance to read the news, be a weather forecaster, see 3D TV, listen to a dance band in the tea room – and even wear 1930s makeup! There's plenty more information on the BBC History website, including footage from the period, covers from the 1930s Radio Times, and TV-related artefacts. You can watch a video of the first black and white broadcast here, and there's lots more info in this special BBC History blog.